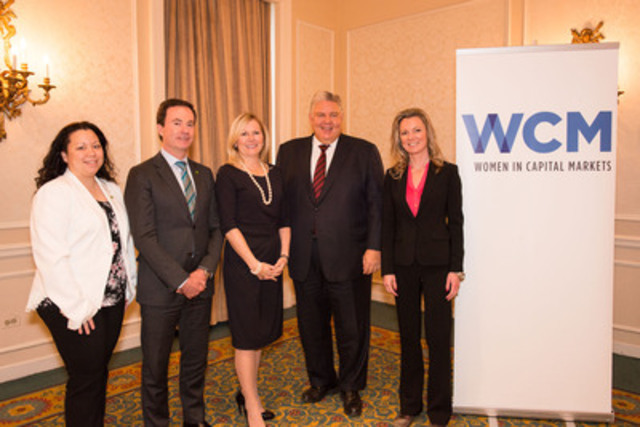 TORONTO, Nov. 19, 2014 /CNW/ - Women in Capital Markets (WCM) and title sponsor EY today announced the 2014 winners of the WCM Rising Star Award, Awards for Leadership and the Visionary Award during a luncheon held at the Fairmont Royal York Hotel. In its fifth year, the WCM Rising Star Award honours an individual who is a high-performing role model at work and has made a lasting contribution by providing inspirational leadership and mentorship to young women in the industry. The winner of the 2014 WCM Rising Star Award is Jennifer Ocampo-King, Vice President, Prime Brokerage, TD Securities. The WCM Award for Leadership, now in its eighth year, recognizes senior executives, male and female, who have combined professional excellence with a demonstrated commitment to advancing and supporting women in capital markets. The Award for Leadership - Male was presented to Robbie Pryde, Vice Chair and Head of Equities, TD Securities and Executive Vice President, TD Bank Group, and the Award for Leadership - Female was presented to Anne Marie O'Donovan, Executive Vice President and Chief Administration Officer, Global Banking and Markets, Scotiabank. The winner of the 2014 WCM Visionary Award is Richard Nesbitt, Adjunct Professor, Rotman School of Management, and Chair of the Advisory Board of the Mind Brain Behaviour Hive, University of Toronto, and retired Chief Operating Officer, CIBC. First established in 2010, the WCM Visionary Award is presented periodically to recognize a senior-level executive with over 20 years of experience in Capital Markets (male or female) for their outstanding life achievements and contributions to the Capital Markets industry and Women in Capital Markets. It was last presented in 2010 to Heather-Anne Irwin, Founding President of Women in Capital Markets. "Sponsorship relationships are key on the path to leadership roles in business and are currently a significant barrier to the advancement of women in corporate Canada," says Jennifer Reynolds, President and CEO, WCM. "We are very excited to recognize today's award recipients for their inspirational leadership in the financial industry and ongoing commitment to creating a business environment that promotes the advancement of women into senior leadership roles." The luncheon also included a presentation by keynote speaker Sarah Robb O'Hagan, President, Equinox - the world's premier fitness lifestyle company. Robb O'Hagan joined Equinox in 2012 and is responsible for Equinox, SoulCycle, Blink Fitness and Pure Yoga brands. She supports the advancement of women's leadership worldwide and has a particular interest in helping underserved girls get access to sports. She has served on Hillary Clinton's US State Department Council to Empower Women and Girls through Sports, and is also a trustee of the Women's Sports Foundation.